Biblesoft's landmark 19-collection on Judaism and the New Testament—an invaluable resource for anyone wishing to study the Jewish background of the New Testament! We have carefully brought together more than a dozen classic works from distinguished scholars—Jewish and Christian—many of whom specialized in the Jewish background of the New Testament: such as Gustaf Dalman, C. G. Montefiore, A. T. Robertson, Alfred Edersheim, and others. These valuable works especially focus on three areas of study: (1) The relationship of Jesus and the New Testament authors to contemporary Jewish culture and religion; (2) References and parallels between Jesus (and early Christians) in the Rabbinic writings; and (3) Messianism in early Christianity and Judaism. 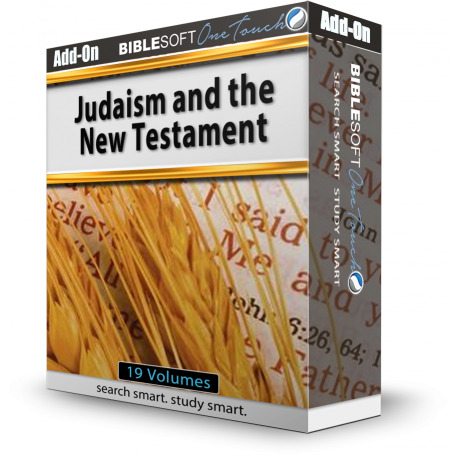 These titles are also part of our DELUXE Judaism and the New Testament Collection, which includes many more resources, including studies on Judaism and classic Jewish writings!